Nearly 1,000 lakes and ponds larger than 10 acres and more than 3,000 small ponds are scattered throughout New Hampshire’s watersheds. They are an integral part of New Hampshire’s quality of life, economy and natural heritage. These lakes history as summer vacation destinations has lead to an abundance of beautiful and surprisingly affordable lakefront homes in New Hampshire. Lakes are a major attraction for short-term recreational visitors, those who own or rent seasonal homes, and permanent residents. Some lakefront homes in New Hampshire are on lakes that are used as public water supplies and have partial or total restrictions on recreational uses, but the most popular uses for most lakes are swimming and boating, followed by fishing. In fact, New Hampshire has approximately 170 public beaches on lakes and ponds. The largest lakes are in New Hampshire’s “Lakes Region” including Lake Winnipesaukee, Lake Squam, Lake Winnisquam and Newfound Lake. New Hampshire’s lakes and ponds provide abundant recreational opportunities; historic, cultural and economic values; and critical natural assets. Over 250 of the most popular lakes in New Hampshire are detailed on this site and include all the homes for sale around them with lake access or are directly on the lakefront. As far as pricing for New Hampshire lakefront houses goes, buildable lots can be found for under $100,000 and the sky is the limit for multi-Million-dollar mansions…especially on Lake Winnipesaukee. We have been passionately uniting buyers and sellers of New England lakefront property since 2009. It’s all we do… all day, every day. 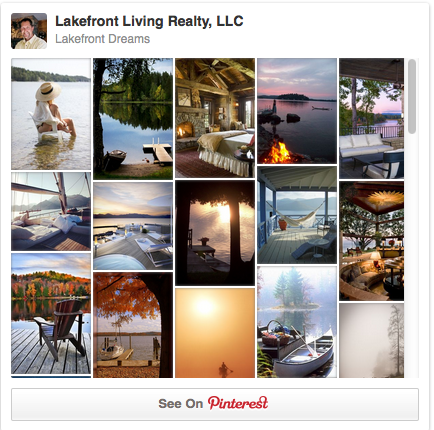 We live the lakefront lifestyle ourselves and understand the intimate details of ALL lakes & properties in the area. We become your “Personal Lakefront Assistant” at no cost to you! We recognize you are not only buying a New England lake house, you are buying a lake and a lifestyle. 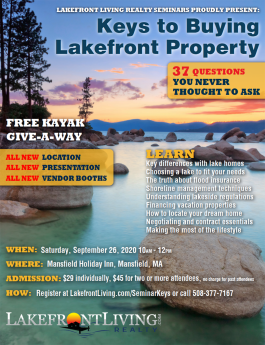 There are dozens of questions that need to be answered specific to any lake and lakefront home you are considering…including our “37-point lakefront property questionnaire”. Our lakefront special agents will coach you through your entire dream home purchase for a worry-free transaction. We even include a free kayak to you at closing! Put our passion to work for you today! Lakefront Living Realty offices are full service real estate brokerages with a mission to passionately unite buyers and sellers of lakefront property.